This month’s clash was one of International flavor, with participants from Australia to Canada writing historical fiction, mysteries and fantasy. The authors are truly a talented group and we are proud to feature their work. Rachelle Rea is so talented. I can't wait to read The Sound of Emeralds. I am currently reading the last book in the trilogy written by author Rachelle Rea. So looking forward to the third of what I hope to be a long list of reading by this author. Christine Lindsay, you work so hard to tell a great story that your books are a delight. The Sound of Emeralds is such a good read, Rachelle! I was in tears when she lost the baby and nearly sobbing thinking that Gwyn would shut out Dirk for good! But you did tell me there was a happy ending, so I was not in despair! Lol Thank you for writing! I so enjoy reading your books Christine Lindsay. Thank you for creating memorable stories that once I begin to read I cannot put down. Lucy Thompson, Great title, great cover! They are all fantastic looking books. Christine Lindsay and Sofie's Bridge! Aside from being a busy writer and speaker, Christine and her husband live on the west coast of Canada. Coming August 2016 is the release of Christine’s non-fiction book Finding Sarah—Finding Me: A Birthmother’s Story. Please drop by Christine’s website www.ChristineLindsay.org or follow her on Amazon onTwitter. Subscribe to her quarterly newsletter, and be her friend on Pinterest , Facebook, and Goodreads. 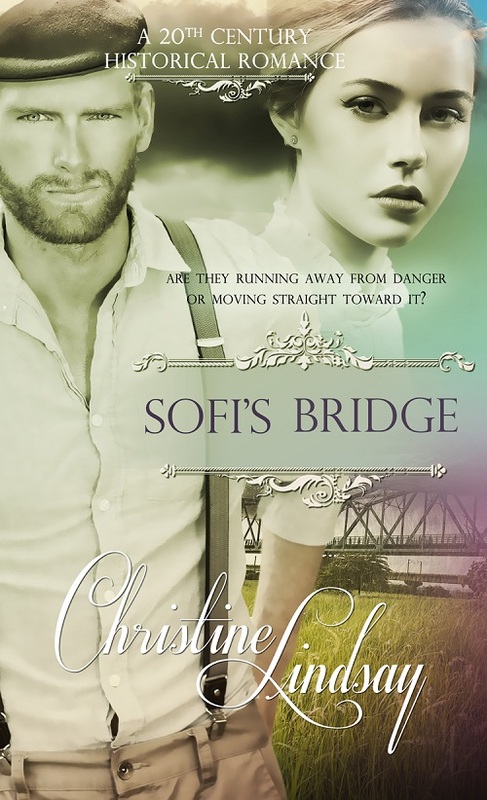 How did the idea for Sofi's Bridge take root for you? I always wanted to write a book about the various types of emotional and mental illnesses that strike individuals and families. In Sofi's Bridge I painted Sofi's mother as a vulnerable woman, addicted to laudanum as she grieves over the sudden loss of her husband. Historically doctors prescribed this heavy narcotic to patients for even the smallest emotional upset, and of course these patients became addicts. This is an issue that is so prevalent today. My own dear mother was diagnosed incorrectly by a busy physician and prescribed heave drugs that she not only became addicted to, but that created a mental illness that she never had in the first place. I stepped in as my mother's advocate to get her to a better doctor, see her weaned off these powerful drugs that she did not need and brought back to full mental health. Today she is the social butterfly at our church, and the card lady who send out greeting and encouragement cards to everyone in our church for all occasions. This is only one of the strong themes in what appears to be a light historical romance. Tell us what's next for you, Christine. I'm writing a new novel, but also eagerly looking forward to the release in mid-August of my non-fiction book Finding Sarah--Finding Me: A Birthmother's Story. This is not just my story as a woman who relinquished my first-born to adoption, but includes other stories of people who have been touched by adoption and adoption reunion. The theme of this book is finding our identity in the face of Christ. Thank you Christine, and congratulations from the Clash of the Titles team. Wow, I am so honored that I am speechless. Thank you so much. And congratulations to my fellow authors. Such a close call for these books, it just goes to show the quality of my peers, Rachelle Rea and Lucy Thompson. It is an honor to be mentioned in the same sentence as these fine writers. It was a GREAT Clash! Thanks all. Way to go Christine! I'm so proud of you. Thank you Ramona, and hugs to you. Congratulations, Christine! Can't wait to read this book. Congratulations Christine, I am going camping on the 8th and so is Sophie's Bridge. I can hardly wait. Summer Reads: Come Vote for Your Fave!